Celery is a kind of vegetable that mainly consists of water. It has a long fibrous stalk tapering into leaves. Celery is definitely a vegetable we recommend offering to your rabbit. Make sure to introduce it in small quantities and don’t be tempted to give it in large amounts in the beginning. For example, start with one small piece and keep an eye on how your bunny reacts to it. Before feeding the celery, cut away any damaged or bruised areas. Then rinse by holding under running water and rubbing gently. Once finished, you don’t even need to dry the celery and can actually serve it wet as this will help increase your bunny’s intake of water. 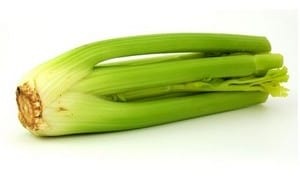 Cut the celery stalks into 1 inch (=2.5cm) pieces. This will avoid strings getting stuck between your rabbit’s teeth. In addition, it will help to make the quantities better controllable as you can actually count the pieces your rabbit gets. As far as portion size is concerned, typically one stick of celery per bunny is recommended. Also, make sure to combine with other vegetables as an adult rabbit should be offered around 3 to 6 different types of vegetables per day. Can Rabbit Eat Celery Leaves? Most people know celery from grocery stores where most part of the leaves have been chopped off. If you are wondering whether your rabbit can also eat the celery leaves then the answer is yes. Try and find a place that sells the celery as a whole. Your bunny will love the lush dark green celery leaves! Conclusion: Rabbits can have celery and from what we read, many bunnies seem to like it quite a bit. Whats your experience with feeding celery to your bunny? Drop a comment below.